The good news is, there are ways to enjoy a trip to Disney World with a baby this summer. Here, you’ll discover some of the top tips you can follow to ensure you have a memorable Disney getaway for all of the right reasons. Staying at the Disney World resort isn’t cheap, but if you have the budget it’s definitely recommended. It means you don’t have far to travel and can easily take baby back to your room if they start to get grouchy, too hot or overwhelmed. Even if you just stay for 2-3 nights within the park, it’s enough to give your baby a taste of the magic, without overdoing it and breaking the bank. If you’re looking to save money on dining out while you’re there, the Disney Dining Plans are a great option. They’re also really fun to use. You’ll receive a Magicband which your meal entitlements are uploaded onto. You then use the Magicband at magic points and you’ll be presented with a receipt showing your new meal balance. With the dining plans, children under the age of two eat for free. You’re also able to make reservations up to 180 days in advance, it eliminates the need for you to carry cash and there’s a huge amount of choice available. When you visit Disney World in the summer you can guarantee one thing – the crowds and queues for the park are going to be insane! There are ways to beat them however and the Fast Pass+ is one of them. The Fast Pass+ gives you the opportunity to bypass the crowds for certain shows, attractions and character meet and greet opportunities. This can prove invaluable when you’ve got an impatient baby with you! It’s advisable you order your pass as early as possible as you can reserve attractions up to 60 days in advance. Another service to add to your Fast Pass+ is the Disney’s Rider Switch Service. This enables all adults to go on a ride, while a chaperone takes care of non-riders, such as a baby or toddler. Summer at Disney World is hot, hot, hot! So, you’re going to need to make sure baby is comfortable. This means dressing them appropriately in loose, light colored cotton clothing. Ideally, you’ll want to keep their arms covered away from the sun’s rays, so opt for a long-sleeved top that’s made from breathable fabric. You might also want to avoid putting socks on your little one if it’s an especially hot day. Of course, it’s not just their clothing you need to consider. There’s a lot of ways you can ensure baby stays cool and comfortable on your Disney World trip. A clever tip is to rinse baby’s sun hat in cold water when they start to become too hot. Then, be sure to wring it out before putting it back onto baby’s head. You can also attach a small, portable hand-held fan to your little one’s stroller. This will consistently blow a nice breeze onto your baby while you walk around the park. You can also use a spray bottle to store nice cold water which can be used to spritz over baby if they do get uncomfortable. While the park is likely to be busy during most times of the day, if you get there at dawn you’re going to avoid most of the crowds. Aim To get there just before the park opens. That way, you can spend a few hours there and leave mid-morning, right as the main crowds start to arrive. This is an especially great tip if your baby is an early riser as they will be alert and ready for a little excitement. Each Disney Park has its own unique Baby Care Center. While it’s been designed primarily with babies in mind, it’s actually great for all young children. You can feed, change and play with your baby in a calm and peaceful environment. Anytime your little one starts to get overwhelmed by the heat and the crowds, this is the place you’ll want to head to. The center also has a great, fully stocked store providing formula, snacks, diapers and wipes. So, if you’ve forgotten to bring something, Disney World has you covered! If you do decide to head back to the hotel after a couple of hours at the park, you can always choose to return later. If you head back there in the early evening, you’ll again avoid the crowds, plus it will be much cooler too. In summer, Disney World offers “Extra Magic Hours”, where the park stays open a little later. So, if you want to beat the heat and the crowds, early evening is the perfect time to go. The weekends tend to be the busiest time to visit Disney World. So, you might want to give it a miss when you’re travelling with a young baby. While it’s still going to be busy during the week in summer, it will be nowhere near as busy as it would be at the weekends. Tuesdays, Wednesdays and Thursdays are the quietest days to visit. Then you can plan some non-park activities during the weekends. 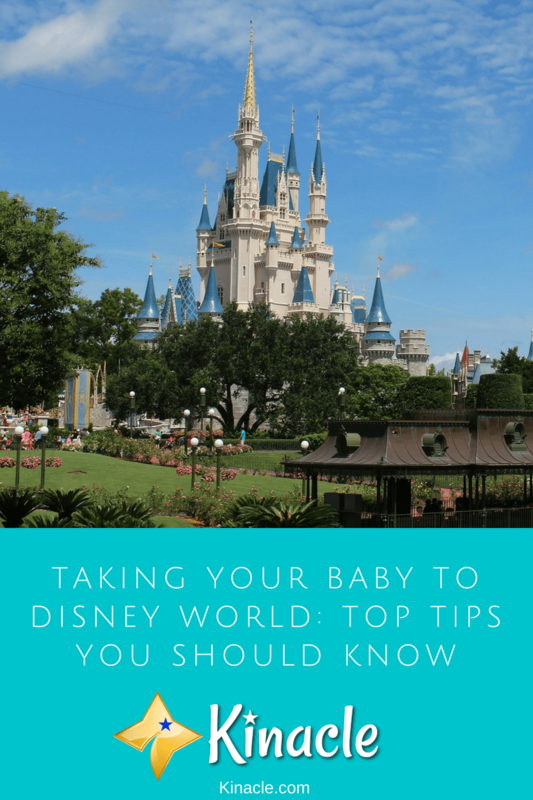 These are some of the best tips you can follow if you do plan on taking baby to Disney World in the summer. When planned out correctly, a trip to Disney World with baby can be a magical and memorable experience.